Mores Creek Summit Backcountry Skiing: 2013 Thanksgiving Skiing! Pretty cool picture ... this was yesterday, mid-morning of 2013 on Thanksgiving Day. Ten centimeters of recrystallized snow in top of a dense and supportive layer that made skiing very pleasurable. The NRCS Snotel telemetry at Trinity Mountain appeared encouraging with close to half meter of snow, and although the Mores Creek Summit Snotel looked discouraging, I felt confident the skiing at MCS will be fun above 7000 feet at protected northerly aspects. 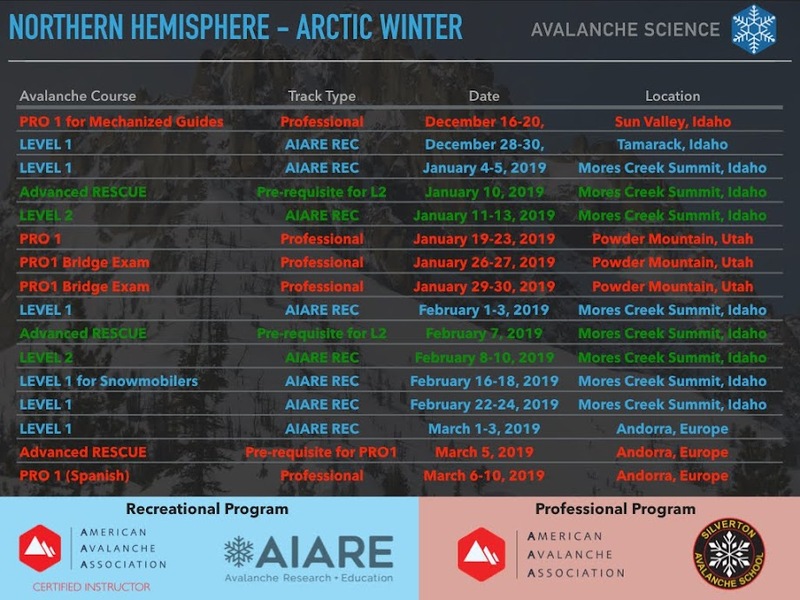 In addition the significant drop in temperature after November 21st held the promise of facetting the surface of the snow to create good riding conditions. The link included below will get you to a map of Idaho with SNOTEL sites. Move the cursor over the sites and the name of the location is interactively shown. The most popular locations used by backcountry riders are: Mores Creek Summit, Trinity Mountain, Banner Summit, Big Creek Summit, Bogus Basin, Brundage Reservoir, Vienna mine, and Galena two sites. The situation looked grim at the Mores Creek Summit Pass (6100 feet), where the dirt road to Pilot Peak starts. But as elevation was gained, particularly above 7400 feet, it started to look wintery. Skiing was fun, and the ski touring was superb on a strikingly calm and cool day. The Central Idaho Mountains views from Pilot Peak Summit and West Glades were magnificent. It could have been perfect if two fools in a vehicle would have not attempted to go up Pilot Peak road and torn-up the snow where otherwise could have been great skiing back to the 6800 feet level, before having to get off the skis, and hike down to Idaho 21. This is a good time to highlight WHY backcountry recreationists will benefit from checking the snowpack. Below a picture of the current snowpack at Pilot Peak west glades. Snowpit at 7930 feet, North 20 degree aspect, West of Pilot Peak. On its most basic expression, we go through the effort of excavating a snowpit to identify a slab or layer of denser and cohesive snow in top of a weak layer characterized by cohesionless snow. Most skier triggered avalanches are slab avalanches. 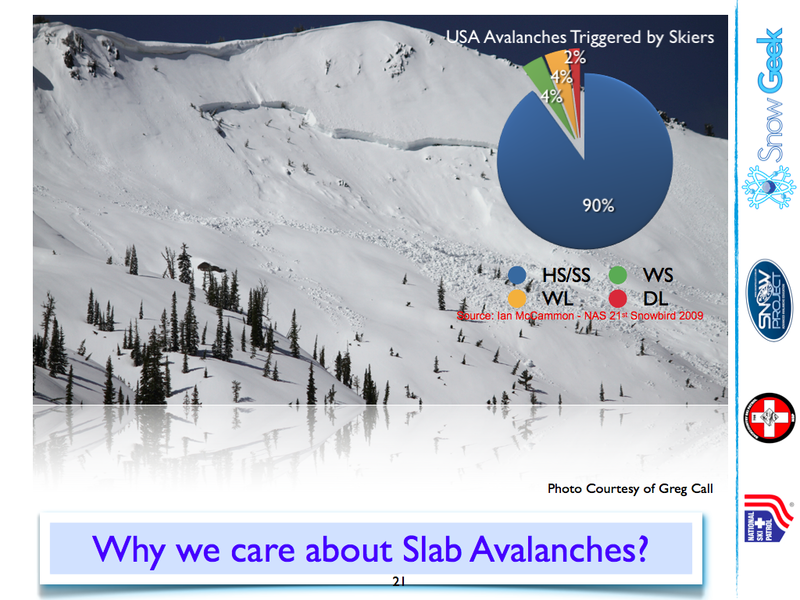 The next image summarizes the statistics in the US for skier triggered avalanches (HS-hard slabs, SS-soft slabs, WS-wet slabs, WL-Wet loose, DL-dry loose). The stability quadrant provides a structured methodology to assess each of the elements of the slab avalanche: trigger likelihood, propagation likelihood, and slip likelihood. 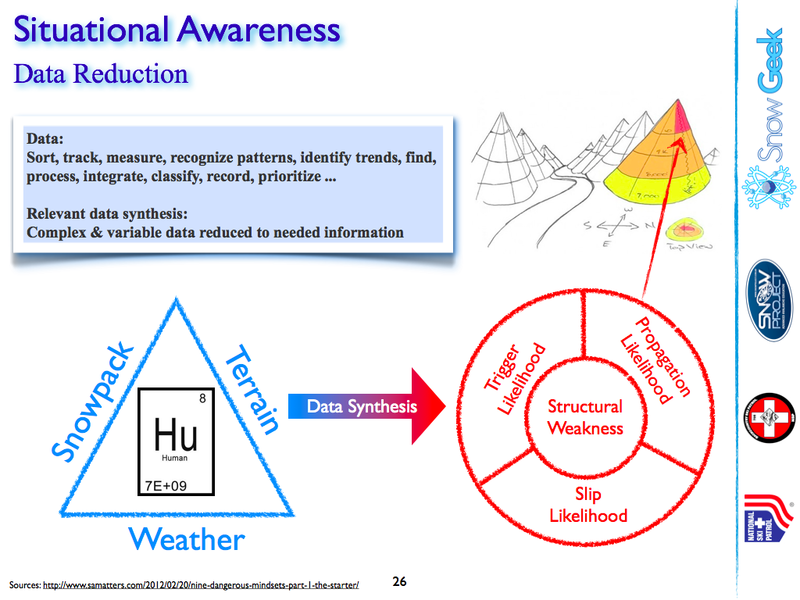 The next slide illustrates how the avalanche triangle (Snowpack, Terrain, Weather) are assessed through the Stability Quadrant lenses and applied to the terrain. 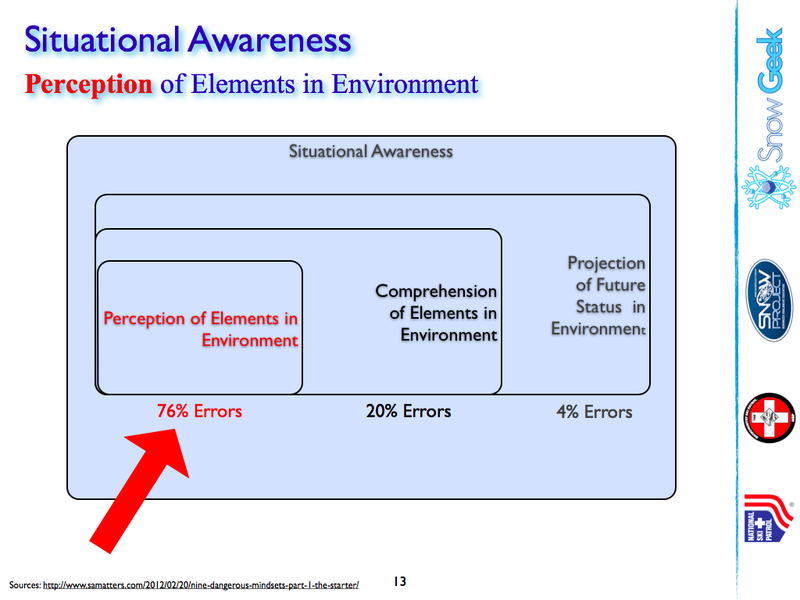 Data reduction is critically important because it is intrinsically linked to the perception of elements in the environment. 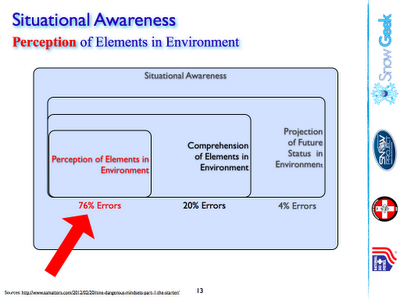 Most human errors are caused by inadequate or poor perception of the environment. 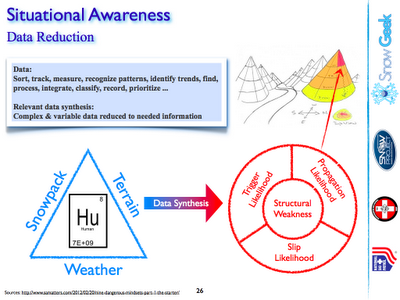 The stability quadrant methodology compels the user to adequately perceive its environment - The Snowpack, The Terrain, and The Weather! Casual observation of Pilot's Peak snowpack at 7930 feet in a North aspect revealed a slab structure, where the top 30 cm of cohesive snow is undermined by a 5cm layer of cohesionless snow sitting in top of a 10 cm layer of hard ice. Not Good! Very loose snow in the glove, sugar like, below a slab of cohesive snow. So what do we do next? Well ... the FUN is about to start! Probe with meter marking, metal shovel with extendable handle, snow saw, and pole able to connect to saw. The trigger likelihood of triggering a SLAB avalanche is HIGH. The propagation likelihood of the slab across the slope is HIGH. The slip likelihood is considered HIGH when either the block experiences a "sudden collapse (or SC)" or easily slides out during the test. This type of slip mode is denominated Q1. The ECT of this video experiences a SC, thus the slip likelihood is HIGH. For more details about ECT, please check the next link for a most awesome and fantastic video. The video demonstrates how to build an ECT isolated column of 30 by 90 cm, and how to perform the test. Please stick to it, at the five minute mark you will be able to clearly see the propagation failure. At the center (or heart) of the stability quadrant the SLAB structural weaknesses are responsible for its triggering, propagation, and slip potentials. 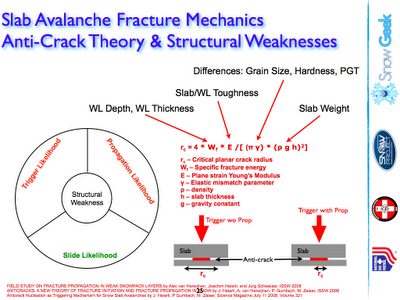 The snowpack structural weaknesses are thoroughly evaluated depending on your level of training and experience. 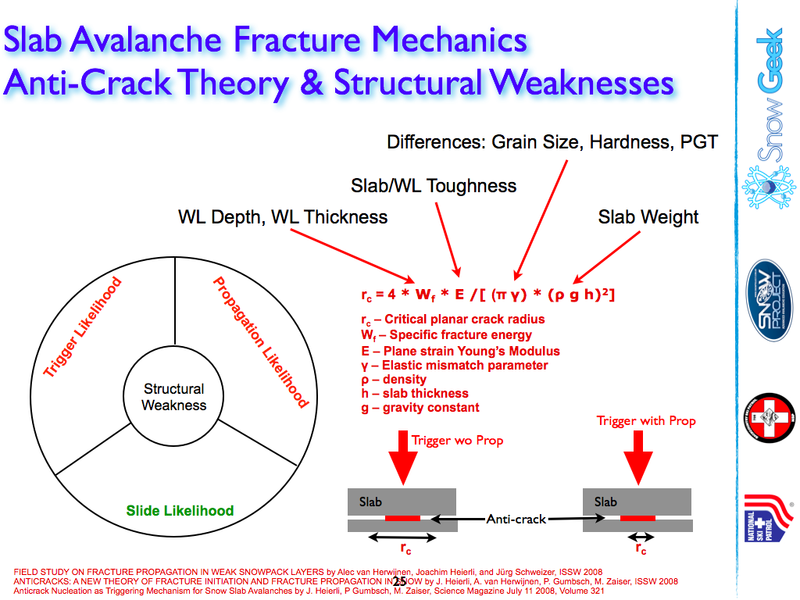 For the Snowgeek I include below the anti-crack fracture equation with the various elements responsible for structures that drive fracture initiation and self-propagating fractures in the snow. Ian McCammon developed a methodology of evaluating structural weaknesses known as snowpack "lemons". This methodology allows to determine if there is a CONCERNING snowpack with a POOR structure if the addition of lemons totals 4 or more. This methodology is quick and fits pretty well for most recreationists needs. Below a link with technical paper. The Weak Layer is less than 10 cm thick - YES, the Weak Layer was 5 cm thick. The Weak Layer hardness difference with the Slab is one step or more - YES, a slab is present. The Weak Layes consist of persistent grain types (PGT) - YES, there are loose and sugarly FACET crystals. The Weak Layer and slab grain size differs by more than 1 mm - YES the facets are 2 mm, way bigger than the less than 0,5 mm round grains of the slab. There are a total of 5 Lemons identified, more than 4 lemons, indicating the the snowpack structure is POOR and very concerning. A quick snowpit reveals the presence of a slab. An ECT is used to identify Trigger, Propagation, and Slip likelihoods. The ECT identifies the most concerning weak layer. presence of slab above weak layer. presence of persistent grains (facets, near surface facets, surface hoar, depth hoar, faceted rounds) in the weak layer. and compare grain sizes of weak layer to slab grains. With practice this process can be completed in no more than 20 minutes. After playing in the snowpit, it was time to go skiing. Later in the day I ran into an acquaintance, Ken, after I skied a nice slope with moderate angles (mid twenties), since I did not think it was a good idea to ski slopes with angles above 30 degrees, particularly when I was solo touring. A very good looking slope! The snow coverage above 7500 feet was not bad at all! Open glades were looking quite tempting. Don't you agree? After several laps at Pilot Peak West Glades, it was time to ski out. At the 6800 feet we got off the skis, and hiked down the road. Transition from skis to booting. 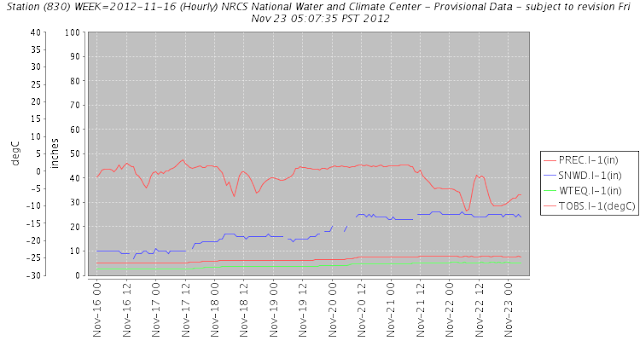 Tonight I will make another posting at MCS Blog for those interested in additional snowpack observations, spatial variability, as well as other other stability test results observed at Pilot Peak during Thanksgiving Day. I did not wanted to go to BIG in the first posting of snow conditions for the 2013-2014 Season. I hope you enjoyed your Thanksgiving Day! Cheers!